The amount of data generated on a daily basis in a hospital is staggering. Whether the data comes from clinical applications, billing, scheduling, or is generated from new technologies for advanced imaging, mobile devices or implants, all hospitals are faced with figuring out the best way to move, manage, and protect this data. While many hospitals opt to incrementally improve aging infrastructures, others prefer a rip and replace method. Both options have pros and cons, but the intended outcome is the same: a new infrastructure in place, enabling hospitals and caregivers to better collaborate, working off a single patient record and using real-time data to significantly improve patient care and reduce risk. Prescribed medications can be quickly cross-checked against patient charts for interactions. Multiple specialists can review the same charts simultaneously. Clinical data can be analyzed to illuminate valuable trends, identify inconsistencies in treatment, and improve operational efficiency. And, as online tools and technologies enable patients to receive more treatment from the comfort of their own homes, hospitals that embrace new technology will be able to extend point-of-care beyond their physical walls. So what — beyond cost — are barriers preventing hospitals from rebuilding or creating a brand new hospital infrastructure? First, with so much at stake, it can be difficult to know where to start and what questions to ask. Looming concerns around data protection abound. There is no room for error, no room for downtime. Agility — Confirm the ability to easily and cost-efficiently move data to the optimal environment for performance and value: on premise, private or hybrid cloud. With acquisition continuing to grow, the ability to integrate and leverage diverse technologies and storage platforms with a unified architecture is a primary concern. Stability — Be sure your vendor demonstrates a commitment to and proven expertise in healthcare, backed by a sound financial track record and partner relationships across the healthcare ecosystem. Data Protection — Select systems that provide cost-effective data backup and recovery, minimizing data loss and speeding time to recovery. Scalability — To future-proof your investment, it is important to invest in an infrastructure designed and built to scale, accommodating growing volumes of clinical data including medical imaging. Security — Ensure selected products have been tested and certified for government security and encryption compliance. Simplicity — Your infrastructure should support limited IT staff as well as offer a unified architecture and platform, which means less equipment to purchase, maintain, and manage. Innovation — Be sure the vendor you select has forward–facing engineering, development, and solution delivery. Make sure your vendor’s vision for innovation matches the hospital’s. Performance — Whether you measure performance on speed, reliability or accessibility of data, find a solution that provides clinicians with consistent quality of service based on what’s most important to your institution and patients. Return on investment — Consider not just the money saved over time, but also how the investment frees clinicians from paperwork, enabling IT staff to focus on higher value including innovation. Speed of transition — Determine how quickly and non-disruptively the solution can be implemented. With the answers to these questions, hospital executives and IT leadership staff will be better positioned to make an informed decision about how to best rebuild or improve their infrastructure. 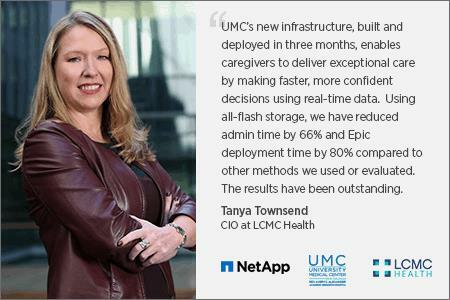 Understanding UMC’s requirements and LCMC’s desire to create an infrastructure that could be easily rolled out to other hospitals within its network, Sapphire Health teamed with NetApp and CMA Technology to deliver an Epic solution that exceeded expectations. Partner CMA Technology simplified the delivery of the core Epic infrastructure, which included NetApp storage, Cisco UCS servers, VMware virtualization, Commvault enterprise backup, F5 load balancers, and professional services. UMC’s deployment was streamlined because of the ease with which the NetApp AFF8080 system running NetApp ONTAP software was deployed. UMC now has the best of both worlds: the speed of solid-state drives combined with clustered storage controllers for high availability and nondisruptive operations. In addition to enabling superb virtual desktop performance, NetApp All Flash FAS (AFF) is improving I/O for critical applications such as GE Centricity PACS and Varian oncology software, sustaining submillisecond storage latency for more than 300 virtual machines. *Statistics from June 2016, when UMC migrated Epic out of Shreveport, LA. Tanya Townsend serves as Senior Vice President and Chief Information Officer (CIO) for LCMC Health, the parent health system which operates and manages Children’s Hospital New Orleans, Touro Infirmary, University Medical Center New Orleans, New Orleans East Hospital and West Jefferson Medical Center. In this role, she is charged with the consolidation, integration and enhancement of information technology environments into a shared services model across the 5-hospital system.